Weaned, or Where's my mamma? Ah! mon Dieu! Is that .. could it be .. grass?!!!!! In between the spasms of horsework, housework (Sarah is back from her honeymoon, hallelujah!) and writing work, there’s always something out-of-the-ordinary to do around here..
Our improvised system seems to have worked remarkably, although I was clearly a bit heavy on my sowing gestures, as we got through nearly thirty kilos of seed, before sinking gratefully into a hot shower, a djellaba and a bottle of something crisp, in front of the evening’s racing. Watch this space for the first blades. My other unusual event these last days has been a visit to NASDA. That stands for National Academy of Singing and Dramatic Art. Yes, I know. I retired years back. I don’t do the twentieth-to-21st century of theatre any more, just the 19th, but … principal Richard Marrett, an old pal, convinced me that inculcated skills never die and that it would be good for the pupils to be confronted by someone – and someome from little old Christchurch what’s more -- who had been and done what they are striving to be and do: so I went. And now I am all involved. So far, I’ve only chatted with the students (79 of them), and some of them with me, I’ve listened to sixteen of them in a ‘performance practice’ class, and I’ve talked a little with their principal teachers. But, when I return, I think a few ‘master classes’ with the more advanced and promising (and vocally interesting) young folk will be in order … and, well, we’ll see. If I enjoy them and they enjoy me, if I can inculcate professionalism into them as well as performing skills, then perhaps I still do have some thing to offer. Another space to watch, but not till the southern spring. Not a top C, not yet .. but decidedly not a flat note ..! Elena out on holidays and Agnes about to start lessons..
Alas, France isn’t up to New Zealand in letting you watch the races minutes after they are run, so I have to wait a bit for that, but I do know that, in spite of pulling behind what I guess was a ‘country’ pace … he came third! It must have been close, for he was originally called second, but I shall soon see. He hasn’t started out with quite the splash which Rosy did (she won first try), but I suspect, deep down inside, he will go on to do more than she has. He is evidently a nice horse, and I can expect some happy times racing him. So bravo Ténor .. ‘encore’!!! Postscript: I've seen it. He led, trailed, and ran on OK. But he ran greenly, pulled .. and the winner won comfortably, with Tenor getting pipped half a length into his third place. Will do better! I’ve been breeding trotters in a very small way for six or seven years now. Not, it has to be said, with any notable success. My first baby, Duchess, was too wicked to make a racehorse; the second and the third, Boris and Wanda, qualified, but never made it to the track.. But then came the year of two mares. Gwen bore her fourth baby, little Seppl, and the Duchess her first, his playmate Fritzl, known to race commentators as The Soldier Fritz. 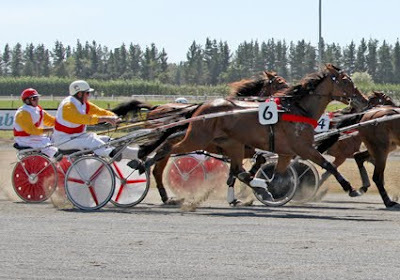 Fritzl not only did make it to the races, last year as a two year-old he even raced in some of the classic juvenile races and finished fourth in the New Zealand Trotting Stakes. A landmark … a cheque … but not yet an official 1-2-3 place. 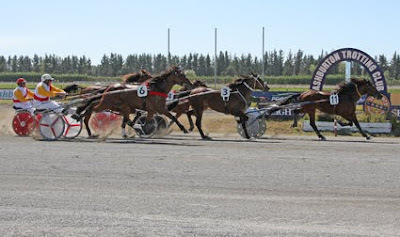 And now they are three year-olds, those two little boys, and if you follow this blog you’ll have read about Seppl’s two encouraging trial wins, and Fritzl’s fine, front-running workout the other day against the champion Glenbogle. Surely one or other of the two would soon break Gerolstein’s duck, and post a divvie. Well, today Fritzl lined up for his first ‘normal’ race. No classic, just a straightforward maiden handicap in the sunshine of Ashburton. Given his workout effort, I was quite surprised to see he was paying 25-1 on the tote… but since I don’t bet. what did I care? I was chuffed to see him behave nicely at the start, in spite of interminable waits for ill-schooled horses, I was chuffed to see him go away smoothly if slowly, whilst around him other horses were prancing and galloping, and when they settled down, there he was perfectly placed in fifth, on the outside. Eleven years ago, in April 1999, my very first horse, Davey Crockett, went to the races for the first time, in a maiden handicap at Hawera. He, too, finished third (though less well behaved). And he paid $5.00. Davey went on to win five races for me.. and I went on in search of other landmarks. PS We are hugely lucky here in the South Island of NEw Zealand to have probably the best racing photographers I've encountered anywhere in the world -- Colin and Ajay Berry of Race Images, take a bow! The walls of Gerolstein drip with the pictures they've taken of our horses over the last decade, and here's what they've sent me of today... a lovely photo of the wee boy in the running, and another showing him finishing on down the outside for third.. I have never seen Wagner’s ultra-celebrated Der Ring des Nibelungen whole, complete and in order. Not on the stage, anyway. Like anyone and everyone else who is or was interested in opera, I remember the famously filmed Patrice Chéreau version of umpteen years ago, which -- via British television -- allowed people like myself (with very limited German) finally to follow the story and even much of the poetry as well as enjoy the music. 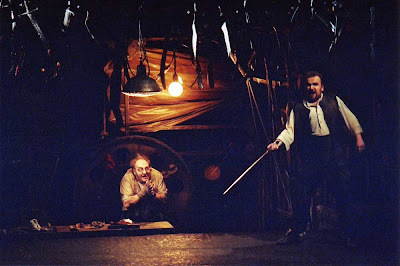 And over the years I have seen a handful of theatre versions of the various Ring-components: from a sceneryless Walküre at the Nice Opera House in the early 1970s to an unmemorable Siegfried at the Royal Opera House, Covent Garden in a year which I also forget. But that’s it. It shouldn’t have happened that way. After all, I was brought up in a home where the stories and music from the Ring, were as familiar as nursery-rhymes, and one of the first long-playing recordings which I owned – aged about ten -- was of Astrid Varnay’s Bayreuth Brünnhilde. I must have worn it out, as I don’t have it any more. Then, aged fifteen or so, when I discovered the big basso voice that would change my life, one of the first pieces of music into which, with the rashness of youth, I greedily flung myself was Wotan’s Farewell. By the time I became a professional singer – with a voice ending at E natural -- I had downsized my ambitions to Hunding. Which wasn’t really much more practical, given that I boasted a twenty-six inch waist, no shoulders to speak of, and weighed in around nine stone. Well, I never got to sing Hunding. I transmuted over the years from operatic basso into musical-theatre guru, and for many years – partly dissuaded by silly, ‘trendy’ stagings -- I did not even visit the world’s opera houses. All part of growing up, girl! So quit pouting and get into that adult food: broodmare mix and water instead of mother's milk..
A last photo with mama, in all probability, as tomorrow is set to be weaning day.